The news has been replete with headlines these past few months about the crisis associated with sub-prime mortgages and the toppling of the sub-prime mortgage industry. American Home Loan, one of the nation’s largest mortgage lenders up until recently, and headquartered here in Melville, utterly collapsed. The sub-prime mortgage problem has been attributed to the drastic increase in foreclosure filings that have skyrocketed this past year. Both the Nassau and Suffolk County Bar Associations have recognized the severity of the crisis by hosting symposiums in October. In this month’s column I will seek to present the problem in a nutshell and discuss ways consumer bankruptcy practitioners can assist their clients. What Is a Sub-Prime Mortgage? A sub-prime mortgage is one that is generally made to a consumer with a poor credit history. These are typically individuals who have low FICO credit scores in the mid-five-hundred range or below, or individuals with blemishes on credit histories due to adverse life events, short employment history, or limited documentation. Since borrowers with sub-prime credit are greater risks, they do not qualify for conventional mortgages that have the most attractive rates. The Sub-Prime Mortgage Market Exploded During the Past Decade. The sub-prime market has grown dramatically because of advances in credit scoring and underwriting technology, which enables lenders to charge different borrowers different prices on the basis of calculated creditworthiness. According to data reviewed in a recent Congressional subcommittee, in 1994, fewer than 5 percent of mortgage originations were sub-prime, but by 2006 about 20 percent of new mortgage loans were sub-prime. Types of Sub-Prime Mortgages. Most of these mortgages are hybrids of Adjustable Rate Mortgages (A.R.M.). They tend to contain both fixed and adjustable rate components; they may have different payment options; or they may require payments of interest only for a period of time. Exploding A.R.M.’s Are a Major Problem. A recent study showed that 72% of all sub-prime mortgages have “exploding” A.R.M. features in which interest rates jump incredibly, sometimes by as much as five percent, such as from a 7% annual interest rate to a 12% annual rate. Factors Leading to Sub-Prime Mortgage Delinquencies. Rapidly increasing property values over the past decade helped to minimize problems associated with these mortgages. However, as a consequence of various economic factors such as rising interest rates, declining property values and a slowing housing market, consumers have faced great difficulty in being able to maintain mortgage payments. Sub-Prime Mortgages Have Extremely High Levels of Default. According to the Center for Responsible Lending, one in five sub-prime mortgages originated during the past five years will end in foreclosure. Most Sub-Prime Mortgage Problems Are Related to A.R.M.’s. Data has shown that the majority of sub-prime mortgage foreclosures relate to adjustable rate mortgages. These loans are often characterized by a rate that will adjust periodically–as frequently as every six months. Many homeowners become unable to make their monthly payments when their mortgage increases, usually unexpectedly, by many hundreds of dollars. When real estate was constantly increasing in value, borrowers with A.R.M.’s were often able to cope with payment increases by refinancing or selling. Lenders Are Culpable for Loosening Sub-Prime Lending Standards. A recent study revealed that an unusually large number of sub-prime loans have gone into default shortly after origination. In many of these “early payment defaults,” borrowers stopped making payments, presumably knowing that they would be unable to meet their ongoing mortgage obligation. This suggests that in 2006 some lenders may have lowered their underwriting standards to maintain volume as borrower demand slackened. It also appears that the rapid expansion of sub-prime lending in recent years, combined with rising real estate values, may have led lenders, investors, and ratings agencies to underestimate risks. The major problem is that a great number of sub-prime lenders have given mortgages without adequate review to ascertain if the homeowner would have the ability to pay. Abusive Practices Abound. The incredible increase in the number of defaults has focused attention on dubious /practices/ of many sub-prime lenders. It now appears that many mortgagees engaged in highly questionable /practices/tactics/ ranging from imprudent underwriting standards to abusive lending practices and even fraud. Some of the abusive practices include high pressure tactics to sign mortgage documents that contain different terms than what was originally promised, and may contain higher interest fees and rate increases. Another significant problem concerns mortgage brokers making deceptive and misleading representations. For example, many homeowners entered into mortgages not even realizing that they were A.R.M.’s. Another significant problem has been the large number of lenders who have given mortgages when it was obvious that the borrower would not be able to afford the payments. Some lenders have resorted to fraudulently using inflated appraisals that did not reflect true fair market value. Other lenders have been found to have “padded” the costs and fees at the closing by not disclosing them, or by requiring the borrower to purchase expensive credit life insurance. 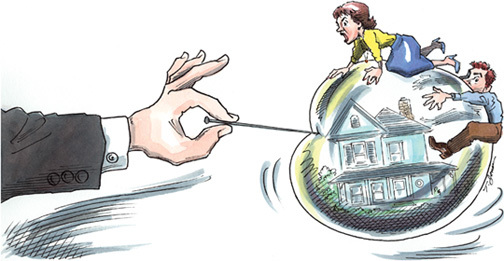 Issues Facing Homeowners With Sub-Prime Mortgages. These consumers are often unable to pay; they face the risk of foreclosure; their credit may be ruined; they are often saddled with higher mortgage payments; they may be unable to re-finance; and they have difficulty selling their properties. Consequently, they may lose realized equity in their homes; they may see a decrease in the value of their home; they may suffer from negative credit records; and they may face the emotional trauma of foreclosure. Helping Your Sub-Prime Mortgage Clients. Many lenders are becoming more receptive to repayment plans, forbearance agreements, loan modifications and short sales. However, some lenders will only review such applications by committee (a lengthy process), and only after the homeowner has supplied substantial financial documentation, only to advise the frustrated homeowner months later that the lender will not do anything to help. No More Deeds in Lieu of Foreclosure. Several years ago, many lenders would accept a deed in lieu of foreclosure. However, as a result of tightening title insurance requirements and also because of provisions of the Home Equity Theft Protection Act, lenders will no longer consider this option. Chapter 13 Bankruptcy Will Stop Foreclosure. Filing a Chapter 13 payment plan bankruptcy will certainly stop a foreclosure proceeding. However, the tricky part is that it will not stop the contractual rate of interest from increasing, which is what may have caused the homeowner to fall behind in the first place. Nevertheless, if the homeowner fell behind because of a temporary financial setback, but expects to be able to cover their mortgage payments in the future, then a Chapter 13 filing may be the perfect solution. Be On the Lookout For New Legislation and Lender Policies. Proposed legislation has been recently introduced that would permit the bankruptcy court to modify mortgages. This is rather controversial and enactment is iffy at best. Meanwhile, some lenders such as Countrywide are anxious to persuade Congress that tighter mortgage regulations are not necessary by offering to work with troubled mortgagors. Thus, some lenders might consider refinances and modifications after all. Watch Out for Scams. The homeowner in arrears is vulnerable and easy prey for con artists. One current scam is “phantom help,” in which a rescuer charges a fee to the homeowner and makes promises to rescue them, but just disappears. The “bailout” is a scheme to persuade the homeowner to sign over title to the premises, in which event the con artist sells the property and keeps the proceeds. Another scam is the “bait and switch” in which the con artist leads the homeowner to believe that the homeowner is signing a mortgage, but in actually is signing over title. About the Author. Long Island Bankruptcy Attorney Craig D. Robins, Esq., is a regular columnist for the Suffolk Lawyer, the official publication of the Suffolk County Bar Association in New York. This article appeared in the November 2007 issue of the Suffolk Lawyer. Mr. Robins is a bankruptcy lawyer who has represented thousands of consumer and business clients during the past twenty years. He has offices in Medford, Commack, Woodbury and Valley Stream. (516) 496-0800. For information about filing bankruptcy on Long Island, please visit his Bankruptcy web site: http://www.BankruptcyCanHelp.com.